Disconnect duck breasts from fat layer. Rub meat with salt, sugar and pepper. Wrap in plastic wrap and leave for 24 hours in refrigerator. Dice fat rind into very fine cubes, add to a saucepan over low heat. Lay duck breast side down. With sharp knife carefully remove skin. Cut off 5 ounces (approximately 1/2 cup) duck fat, chop into fine dice; reserve. Discard skin. Remove meat from carcass, cut meat from the breast and from the thigh in strips. Do not use meat from lower leg. 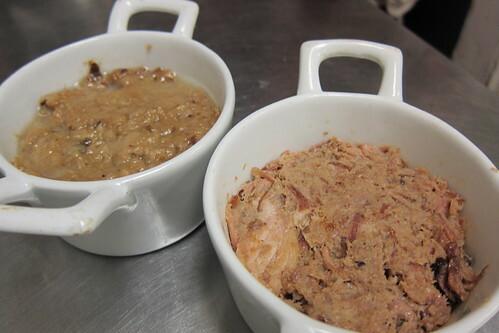 Duck & Fig Rillette: I appreciated how good this was, but I wouldn�t say it�s high on my list of favorites. The fig and duck were perfect compliments, but the more I eat it, the more I realized I�m just not a rillette/pate kinda gal.